Porcelain Veneers are an amazing cosmetic dental treatment that can give you an A-list smile in a matter of weeks. This is a popular treatment that is able to produce incredible results. Dental veneers are fine tooth-shaped pieces of porcelain, which are fixed to the front surfaces of your teeth to create a gorgeous, flawless smile. They are often compared to false nails because they are fitted to the natural teeth in the same way that false nails sit over the top of nails. As a first option, teeth whitening will be offered as this is cheaper and simpler to do and may act as a precursor before any veneer work to enhance and improve the final colour outcome. We currently offer teeth whitening for both top and bottom teeth. Results usually show after 2 weeks but you may continue if you wish to further gain lighter colour. Not always predictable due to variations in enamel and existing discolorations. Genetic disposition: oftentimes, patients might some crowding of the teeth in the front of their mouth as a result of inherited family genes. If you have crowed teeth, gaps or unusually shaped teeth at the front of your mouth, you often won’t braces; they don’t look great and can be quite uncomfortable. In this case, veneers may be able to assist. Trauma: you may have suffered some kind of trauma, or been involved in an accident which has resulted in a number of chipped, cracked or discoloured teeth. Trauma, accidents and even some dental treatments can cause teeth to turn grey. Veneers can help in all these situations. Worn and broken teeth: naturally, teeth become worn with age. This can deteriorate a persons smile and self confidence. Veneers are clearly an option in improving a person’s smile. This treatment has been made famous by celebrities and makeover television shows, but anyone can choose this impressive treatment to transform their smile. Before treatment can begin the teeth must be prepared. This involves removing thin layers of the tooth enamel and will be carried out under local anaesthetic. When the teeth have been prepared impressions will be taken of your teeth using dental putty. 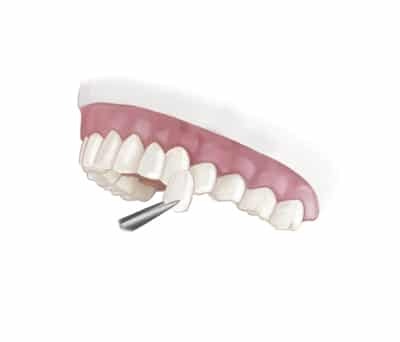 This forms a key part in the fabrication of your custom-made dental veneers. The porcelain veneers can then be fitted and you can show off your amazing new smile. We will check that you are happy with your new smile before the treatment is complete. 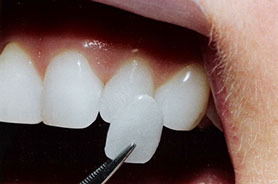 Veneers will not only give you a great looking smile, but also ensure that you feel confident when you smile.